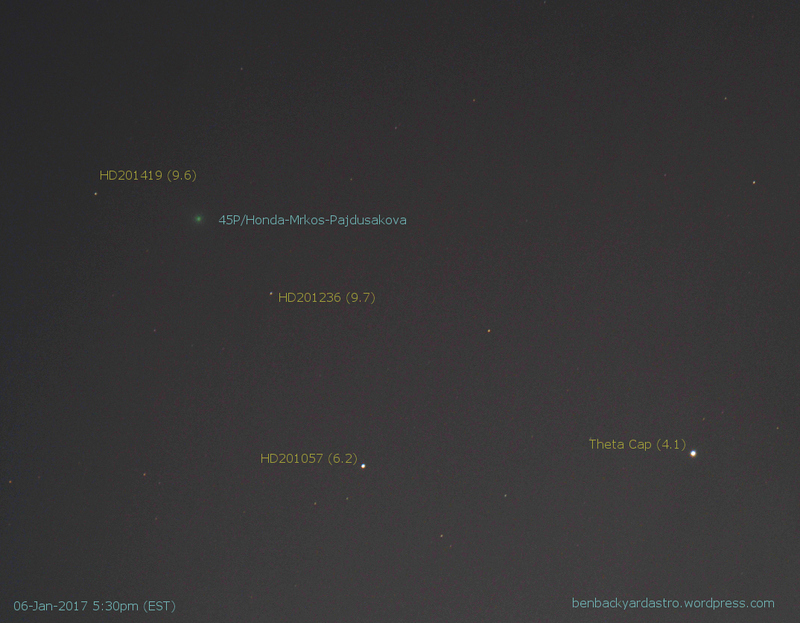 It wasn’t easy but on Friday the weather cooperated and I was able to capture a glimpse of comet 45P/Honda-Mrkos-Pajdusakova. That’s if you consider -10°C outside temperature to set-up a telescope and operate a laptop cooperation from Mother Nature. In my previous post I gave myself a 2-day challenge to capture this comet as it was essentially the last few days at a decent magnitude 7 brightness before becoming non-observable as it swings around the sun over the coming weeks. And when it returns to the northern latitude sky in mid-to-late February it will be dimer at magnitude 10. In the image below, I labeled some of the brighter stars with their visual magnitude as reported by the Tycho-2 catalog. I had a very small window of about 30 minutes to make any observation and photograph it. The challenge started with setting up without polar alignment; the sky was still too bright to locate Polaris, and instead relied on the position of Venus to align the mount. As it was still twilight, I was limited to short exposures to keep the histogram on the left half on the camera and to make out a star from the background sky. I actually started at ISO 400 with only 1 second exposure while adjusting the focus around Theta Cap (magnitude 4). And as the minutes ticked by I was able to slowly increase my exposure as the twilight darkness permitted. With neighboring trees, and rooftops coming into view I had to grab as many frames as possible. In the end I got 14 images with 6 seconds exposure at ISO 800 before calling it quits. With such short exposures no chance of capturing any comet tail, but the green halo is unmistakable comet. I hope to capture a few more comets this year. Registered and stacked with DeepSkyStacker. Post-processing with GIMP. This entry was posted in Observing, Photo and tagged Astronomy, Astrophoto, Astrophotography, Comet by Benoit Guertin. Bookmark the permalink.